Haq's Musings: Are Indians Rooting For Pakistan Against Australia? Are Indians Rooting For Pakistan Against Australia? The Australia-India ODI washed out at ICC Championship tournament in South Africa today, dimming India's chances of a place in the semis. The only winner of this result is Pakistan, who are now assured of a semi-final spot. The fate of Australia and India now rests with the final two matches in the group, both on Wednesday. For India to progress they must thrash West Indies and lift their net run-rate while also hoping Australia lose to Pakistan; any win or no-result for Australia in their remaining match and they are through. It will be interesting to watch Indians rooting for Pakistan side in the Wednesday match between Australia and Pakistan. Earlier on Saturday, Pakistan beat India by 54 runs in ICC Champions Trophy group A match in South Africa. In the India-Pakistan encounter, Pakistan batted first, setting a target of 303 runs for India to win. India were all out for 248 runs. India put up a good fight but it just wasn't enough to win. With two wins from the two matches under its belt, Pakistan now leads the group A table, followed by Australia, India and West Indies in that order. Pakistan will play Australia in its final group A match on Wednesday Sept 30, 2009 at Centurion in South Africa. 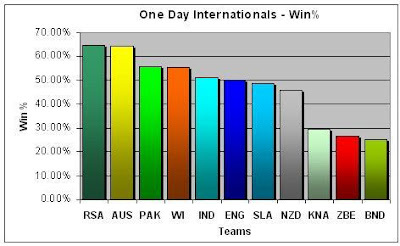 It will be nice if Pakistan remain unbeaten in its group matches. But, regardless of a win or loss against Australia, Pakistan is now virtually assured of a semi-final spot for this ICC Champions Trophy in South Africa. Yesterday's washout gives an insight into the Indian mindset. Cricinfo website reports that the washout has hit India's chances of qualifying for the semis, whereas it has most likely helped them because Australians were in a strong position and a 300+ score seems difficult to chase for Indians on their present form. Australian victory would have put India out of the tournament already, while now they have a chance. Although in Indian interest that Pakistan wins but deep down Indians don't like supporting Pakistan for any reason even if to their own benefit. 1. Go all out and defeat australia heavily and knock them out of tournament. 2. Hold your cards as you are likely to face them in final. if australia has problem playing spinners this time, they might adjust when it matters in final. I would go with 2.
here is businessweek admitting that chandrayan made one of the most important discovery in moon mission. of course you won't post this as this would mean you have to eat crow publicly. Anon: "of course you won't post this as this would mean you have to eat crow publicly." First, what does Chandrayaan have to do with this post on cricket? Have you "discovered" a new link? Second, What does Businessweek know about space exploration? Since when are their opinions, with a hint of sarcasm about Indian mission, become so important in the world of space science?